A Toast To Brindis, under jockey Uriel Dominguez,winning the Rock Springs Wyoming Bred Derby Sunday afternoon at Sweetwater Downs. ROCK SPRINGS, WY—SEPTEMBER 9, 2018—A Toast To Brindis was much the best in the $16,500 Rock Springs Wyoming Bred Derby on Sunday at Sweetwater. 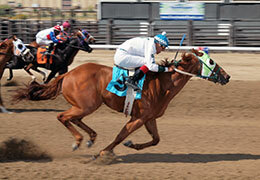 The 3-year-old gelding won his fourth consecutive race and is now undefeated in two attempts at 400 yards. Final time was 19.796 and the winner earned a speed index of 98. A Toast To Brindis ($4.60) was the post-time favorite and the fastest qualifier from two trials on August 26. Uriel Dominguez had the mount in the final for trainer Jessie Villegas. The winning pair broke sharply and maintained their lead to win by over a length at the wire. A Toast To Brindis is a multiple stakes winner whose earnings now total $48,856 in 14 starts. He has won nine races, including five of his last six, and had never been out of the money in Rock Springs. Gerald Kaul owns and bred the gelding in Wyoming, by Brindis Por Cayenne and out of A Secret Life, by Beduino Secret. The race for second place was won narrowly by Favorite Fire Boy and Jesus Osuna, who finished a nose in front of Dust Stone and Jesus Valenzuela. Favorite Fire Boy was the fifth fastest qualifier, winning his trial easily. The multiple stakes qualifier is still seeking his first stakes win, but is stakes placed and has earnings of $41,665 in 20 career starts. The Favorite Cartel colt is trained by Diana Garfas for owner Aron Saenz. He was bred in Wyoming by Jim Streelman and Bill Dale, out of the Walk Thru Fire mare Club Pro. Dust Stone, trained by Riley Moosman, was the fourth fastest qualifier after finishing fourth in the trial won by A Toast to Brindis. The 3-year-old gelding was bred by his owner, Jim Nebeker, in Wyoming, by First Prize Stone and out of the Snowbound mare Dreaming Snow. Dust Stone has multiple stakes appearances and wins to his credit. The winner of the 2017 Energy Downs Wyoming Bred Futurity last fall, he returned to win the Energy Downs Wyoming Bred Derby this summer. Completing the field were Tiny Capitana,Foose Dust, Eyesa Special Cucouy, Kr American Pi, Unstoppable Honor, Innosent Cat and Cente Version. Cente Version finished in sixth place but was disqualified and placed tenth.